When a car key breaks, it can be a very stressful especially if half of it ends up stuck in the ignition or the car door lock. When this happens, it is highly recommended to call an experienced locksmith to extract the broken key and avoid trying to do it on your own. Many people think they are saving money by attempting to extract the key and end up shoving the key deeper and even sometimes bending the lock wafers. If lacking the experience and know-how, a key extraction job can be very complicated even for a locksmith. This is why when you shop around for a company that does key extractions always make sure that they give you an upfront price. When a locksmith is unable to give you a price over the phone, it is usually a sign of inexperience. Any locksmith that has proper experience with key extractions should know exactly how to price such jobs. Also, when shopping around for a locksmith, always make sure they won't charge you anything if they are unsuccessful. It has been a long running scam for some companies, to send a very inexperienced technician to a key extraction. Once there, he can pretend to attempt the extraction for a few minutes and then charge the costumer for coming out even if he was not successful in extracting the broken key. 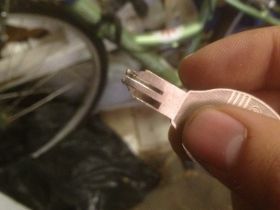 When a car key breaks, unless you have an additional copy, you will need to get a new one made. Most key duplicators at hardware stores like Home Depot or Lowe’s cannot duplicate broken keys. Usually the best practice is to cut a new car key by code instead of tracing a copy from the old one. Cutting a new key by code means that a locksmith is originating the cut specifications for the key instead of just duplicating the worn out or broken key. This process costs more than just a standard key duplication, but it is more accurate and precise. Think of it like copying a VHS tape, the farther you are from the original copy the less accurate it is. Many times, when a broken part of a key ends up stuck in the ignition lock, the ignition lock might still turn when inserting the other half in there. If this is the case you should avoid turning the ignition at all costs. Turning the ignition lock with a broken key can cause exponential damage to the car; therefore if this is the case you are much better off calling a professional locksmith right away.